Serrano Campground is a beautiful year-round campground nestled right by the shore of Big Bear Lake in the San Bernardino National Forrest. Run by California Land Management, Serrano is only 10 minutes away from (the city of) Big Bear Lake and 15 from The Village at Big Bear. This is one of the few campsites that remains open year round, and is a very popular destination for its proximity to the water and the East Drive Boat Launch, as well as the trailhead of the popular Cougar Crest Trailhead. Check out the Vlog below to check out a running video compilation of our stay! As you can see in the video, Serrano is designed in harmony with the pine trees and has very spacious sites. It has 98 tent sites and 30 full hookup sites. There is a 2-day minimum stay on weekends, 3 days if it’s a holiday weekend. It’s $28 per night for just a single site, with a $5 charge for an extra car. A double site is $56; check the map below for the few double sites throughout the campground. For a hook up site for an RV, it’s $38, where an RV and tow vehicle or truck and 5th wheel/trailer is considered one vehicle. There is a dump station within the campground. Overflow parking is available on North Shore Lane. The campground is split basically half and half between the sites with hook-ups and normal tent sites. In our opinion, the tent sites are far better than the RV hookups: further from the highway, under the tall pine trees, and more spacious. Reservations can be made 6 months to the day in advance, and there are definitely weekends where you will need to reserve your site this far in advance (think 4th of July, Labor Day, and major Big Bear events like the upcoming film festival). Even during weekdays in the summer be prepared to reserve in advance unless you’re open to reserving different campsites on different nights. Firewood can be purchased from either the hosts or the front office for $7. The campground is split into 4 separate loops; Summer Wind, Strawberry, Lake View, and Evening Star. The best sites are located in Lake View and Evening Star, except if you’re in an RV and Snowberry is your only option. The best sites are #6, 100, 116, 122, 130, 131, and 132. Besides #6, all of these sites are in the last two loops, where the pine trees begin. Theres very few actual bad sites. Try to avoid 111, which is small, right next to the bathroom, and doesn’t have shade. Also, be aware that sites #16-24 are right below North Shore Drive (Highway 39). There’s usually not much traffic at night, but it’s more pleasant without the noise of cars driving by. The map above cuts off the rest of North Shore Lane, which continues west past campsites 112/113, 114, and 115. There’s very light traffic, with access to the Big Bear Shores RV Resort and a general store at the end, but those sites are still very close to the road. What this map also misses is the complex network of trails that wind their way around the north shore of Big Bear Lake. Near the campground entrance is a confluence of the Alpine Pedal Path and the Cougar Crest Trailhead, where you can choose to take a stroll (or bike ride) north through the Meadows Edge Day Use Area (more on that later) or begin your stroll to the Big Bear Discovery Center (the new nature and information building), or hike up the Cougar Crest Trail. The Alpine Pedal path continues East all the way until the Stanfield Cutoff, and also runs West to the town of Fawnskin; a great way to access the lake or just enjoy the scenery. Even if you don’t bring a bike, the walk down the Alpine path brings you right along the edge of the lake. Unlike the south side of Big Bear Lake, where almost all lakeside property is private and developed, the north shore is devoted to public access and is mostly managed by the forrest service. The Cougar Crest Trail is one of the most popular hikes of Big Bear, and for good reason. Although it is only about 5 1/2 miles roundtrip, there is some serious altitude gain until you reach the summit of Bertha Peak at 8,200 feet. If you want to read more about Big Bear Hikes, we typed out the official Forrest Service guide at the bottom of our review. We stayed in site 100, one of the sites we recommend. Like the other sites we picked, it had a decent amount of privacy, has copious amounts of shade, and was also more than large enough for our needs. Personally, we loved the feel of camping among the pines as well. There was also abundant water pumps around, about 1 for every 2-3 campsites. If you decide to wash your dishes in one, beware that it is not allowed by the management since the soap pollutes the drainage systems (the water is ground filtered again, and not sent to treatment). Obviously it is not very convenient to wash dishes in the bathroom sinks, which we guess is the alternative. We were also right by the bathrooms, which happened to be a pleasant surprise. The bathrooms were kept very clean, had sinks and paper towels, and also had electrical outlets, where one very popular guy had set up a USB charging hub to charge over 6 phones at once. There are also showers available. Each loop of the campground has its own bathroom building, so there usually isn’t a ridiculous line, even in the morning. Although there is a small general store right down North Shore Lane, most people prefer to stock up at the Big Bear Lake grocery stores. For even lazier people (like us after a long hike), there are many restaurants near the Stanfield Cutoff as well, although nothing beats taking the extra 10 minutes to drive into Big Bear Village to enjoy the shopping and ice cream shops. We decided to grab pizza from Red Barron Pizza for our second night (we did cook some awesome bean and cheese quesadillas the first night, so we deserved a break from cooking and dishes), which was awesome – if you’re looking for good Big Bear pizza that’s the place. Serrano isn’t the closest, but the stores are easy to find and are only a few minutes away. There are also some stores in Fawnskin, but not on the scale of the chain groceries back in Big Bear. Fawnskin is more the place for a more local fare, such as cafes and small stores. The most pleasant surprise about Serrano was really how close to the lake we were, and that we had access to it as well. Without even venturing down the Alpine Pedal Path, we discovered a short path through the grass to the shore, where you could wade into the lake for a great view of the solar observatory. The Meadows Edge Day Use Area entrance is directly across from the entrance to the campground, only a short stroll from your campsite. If you’re looking for a good spot to picnic, this place can’t be beat. Don’t be fooled by the photo below – this place was pretty busy on a Wednesday morning – just imagine a Saturday morning. There are a few spots like the one in the picture, close to the parking lot and bathrooms, in the shade, and within a stone’s throw of the water. There were also multiple paths that wound their way throughout the pine trees to explore. 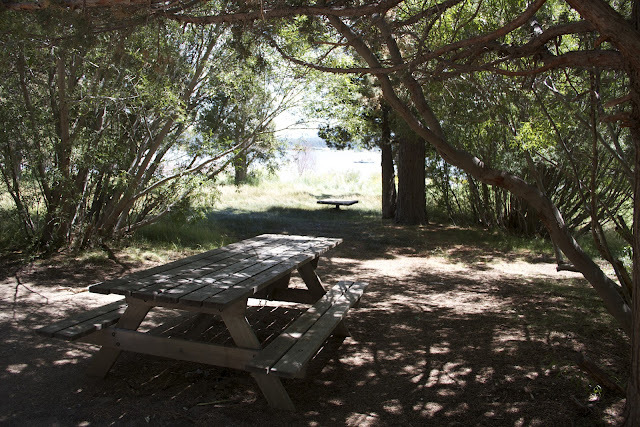 More picnic tables were located further away from the water in a more wooded setting as well. You need to buy an adventure pass to park in the Day Use Area, which are sold at the campground and the Discovery Center. If you want to launch boats, you have to travel further East on Highway 38 to reach the boat landing. If you couldn’t tell, we really enjoyed our stay at Serrano, and are planning on going back to Big Bear in the near future. It’s hard to beat the location of Big Bear, both the lake and city itself as well as the proximity to LA. The beautiful hikes combined with the endless opportunities of the lake make an abundance of activities for both energetic outdoor adventurers and overworked vacationers looking for an escape. Reservations can be made at Recreation.gov or by calling 877-444-6777. 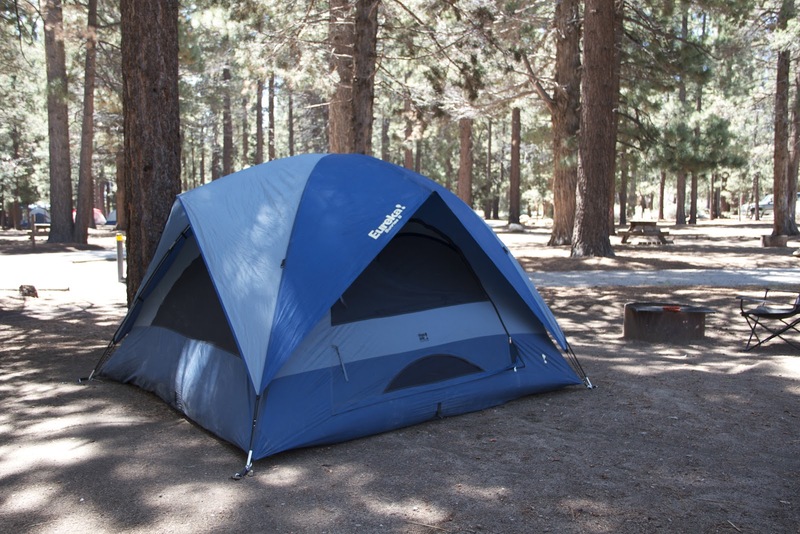 The campsite numbers are 909-866-8550 or 909-866-8021. We also included a map of the area below for your reference, and continue reading to explore the Big Bear Valley Hiking Guide below! As always, let us know if we missed anything or if you have your own observations of your recent trip to Serrano, we’d love to hear about it! The Alpine Pedal Path – Very Easy – 3/12 Miles – Travels along the edge of Big Bear Lake from the Solar Observatory west of the Serrano Campground to the Stanfield Cutoff. It is not flat, but its ups and downs are fairly gentle. Part of this path branches off at the entrance to the Serrano campground to pass under Highway 38 to connect with the Cougar Crest Trail and reach the Big Bear Discovery Center. The Woodland Trail (1E23) – Easy – 1 1/2 Mile Loop – This path starts and ends at the trailhead off Highway 38, only .2 miles west of the Stanfield Cutoff. It is an imperative trail with 20 posted markers, ideal for families with small children or anyone looking for an easy and educational day away from the shops of the Big Bear Village. Pamphlets are available at the trailhead. An Adventure Pass is required for parking. These companion paths are located on the south side of Big Bear Lake. After driving up Mill Creek Road (Forrest Road 2N10) for 4 1/2 miles, make a right on Forrest Road 2N11, where after a mile you will find the trailhead of the Champion Lodgepole Pine Trail. The .3 mile trail ends at the Champion Lodgepole Pine, one of the largest Lodgepole Pine trees in California. From here, the Bluff Mesa Trail begins, which ends at the popular Bluff Mesa Group Campground .4 miles away. No bicycles are allowed, and visitors are asked to stay on all trails to not disturb the beautiful meadows alongside, which are full of wildflowers in the spring. An Adventure Pass is required for parking. Castle Rock Trail (1W03) – Moderate to Difficult – 2.5 Miles Round Trip – The most popular trail in all of Big Bear begins shorty before the Dam on Highway 18 (1.1 miles east of the dam to be exact). The only parking available is 50 yards east of the trailhead alongside the highway, and as you can image, it fills quickly. The elevation gain is what makes this trail difficult, despite only being 2.5 miles roundtrip. After climbing over 500 feet in less than a mile and a half, you will reach the popular granite rock outcropping, where most will stop and enjoy a picnic lunch. The more adventurous types will test their rock climbing skills by clawing their way up to the top of the rocks, where the view of the lake is wonderful. An Adventure Pass is required for parking. Pineknot Trail (1E01) – Moderate to Difficult – 6 Miles Round Trip – This trail begins at the Aspen Glen Picnic Area and runs south until reaching aptly named Grand View Point at 7,784ft. Serious hikers can make this trip in 3-4 hours, but most will plan on spending some time at the summit with a picnic lunch while enjoying the view. An Adventure Pass is required for parking. This trailhead is located on the west side of Highway 38, .6 miles west of Fawnskin, across from the Grout Bay Picnic Area (this trailhead is in the center of a blad eagle wintering habitat area and is closed to all public use from Novemeber 1 to April 1). The trail will merge with forrest road 2N04X after a half mile, where it will then join forrest road 2N70. Go straight, not left, and continue to the beginning of Gray’s Peak Trail. From there, it is about 2 3/4 miles to the top of Gray’s Peak. The trail fades as you get to within 1/4 miles of the summit, and gets increasingly more difficult as you will have to navigate buckthorn and figure ways over and around boulders. The trail to Hanna Flat begins 50 yards past the Gray’s Peak Trail sign on the right and continues for 4 miles to the Hanna Flat Campground. Cougar Crest is one of the most popular and well maintained trails in the Big Bear area. It starts .6 miles west of the Big Bear Discovery Center (across highway 38 from the Serrano Campground), where you can park for free until 6pm. In the first mile there is only a gentle uphill increase, but in the 2nd mile you will begin to pick up serious altitude. 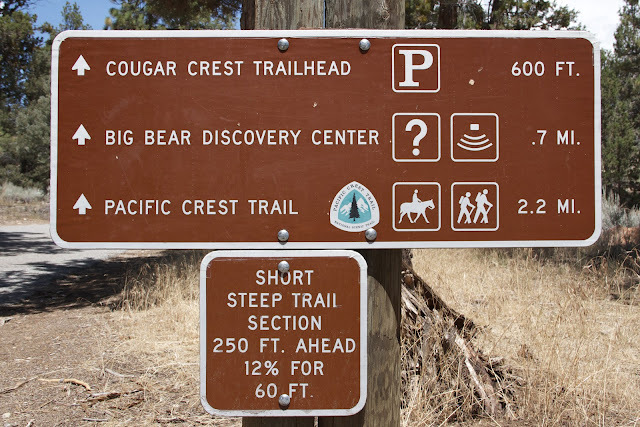 The Cougar Crest Trail ends at the Pacific Crest Trail, where most will continue to the east (right) on a dirt maintenance road for a half mile to the summit of Bertha Peak, 8201 feet, and home to a large amount of transmitting equipment at the top. From here, you are treated to a 360 degree view of the Bear Valley, Holcomb Valley, and even the Mojave Desert.